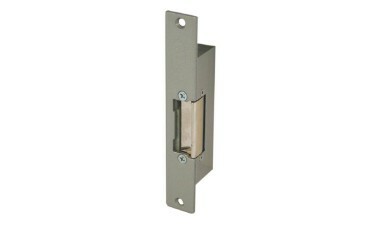 Asec A1/A95 Low duty Electric Strike Release. The Asec A1/A95 voltage 12vDC/24vDC are continuously rated. Hi guys, my name is Darrel. I'm head of the tech team here at LocksOnline.co.uk. Thanks for taking some time to tune in to one of our product review videos. The product we're actually going to have a look at today is the Asec A1 Mortice Strike Release, and here it is here. Now, I wanted to go through some of the features and so forth with you so it'll give you an opportunity to see exactly what this does and how it all works. Now this is the failed locked version. In other words, when there's no power connected to it the actual latch is locked. So that's what failed locked means. There's also another definition as well in the industry called fail secure. So if you see FS, it probably would mean "fail secure" but it can actually mean "fail safe" as well. So, if you're thinking of whether or not you need one and it's saying FS or FL, if it says FS and FL then fail locked it will be, or fail safe. This particular one is fail locked. 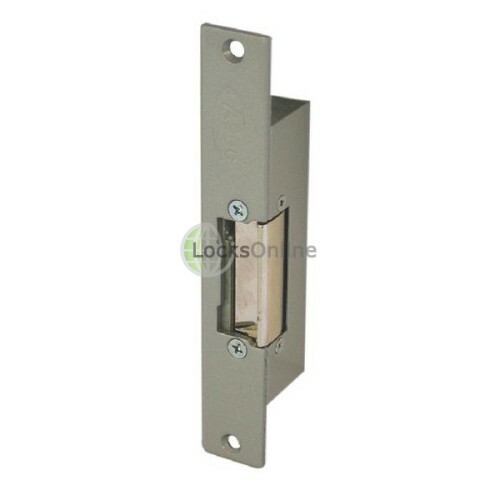 If it was fail safe then this would open and you would need power permanently to connect to it to stop it from opening. Now this is the AC version. So you would connect 12 volts AC to this, and here's the terminals here sitting at the top there. Okay? Now what makes a characteristic of AC is that when you apply AC to one of these strike releases, they create the sound like... as they're opening. I know it sounds a bit silly, but if you're thinking that you need to change one, and you're not 100% sure if it's AC or DC, if when you press the button and it goes... then you know it's AC. If you and you say to yourself that it just clicks, goes "click" then its DC. But this is the AC version. So what I'm going to do is I'm going to get some measurements for you now, so you can actually see whether or not this is suitable for you. So face plate size is... let me just get that measurement for you there... it's 160mm as you can see there. That's 160mm. The width there is 25mm. Okay. The face plate height there is 115, I'm sorry, 105mm to there. That's 105mm. And it's depth here on the back, because there's a slight shoulder there if you can see, but the depth on the back there is 20mm there, guys. The distance from there to there, as I get that for you as well, that there is 45, about 46, 47mm across. And the depth of the latch that a lot of people forget about, the sit in there, that depth there is, we're talking, 9mm. So that depth in there is 9mm. It goes down by 9mm. These are one of the most basic and most common forms of strike release. It's universal. It's used a lot on door intercom systems like Videx may use this particular system. Terraneo, BPT, there's a whole host of AC generated door intercom systems that would use this strike. It's very light duty. It's not designed really for heavy commercial applications, but for a small, little home or something like that where the yard access is now and again, then this strike would be fine for that. So there you go guys. I hope that's given you a little bit more information, but should you need more information and I haven't given you enough, we're on the phone in the day. You can contact us. You can use email or live chat. We've got live chat on our website where you can have a chat with us at any time that you want. Well, during the day anyway. But more importantly we'd love to see you as a customer. So, from me, Darrel, and all of us here at the team, I hope this video has given you a bit more input. But from me, take care. Bye-bye now.